Pakistan’s recent struggles in South Africa during the Test series seem to have drawn a lot of unwelcome attention for one of world cricket’s most respected sides. Whilst Pakistan’s batting woes in all formats of the game are an open secret, what has been particularly painful for many followers of Pakistan cricket is the lack of fire-power in the fast-bowling department. It is in this context that the news of Usman Khan Shinwari’s exploits during his recent stint in the Big Bash League tournament has provided a positive outlook for Pakistan in the area of fast-bowling. 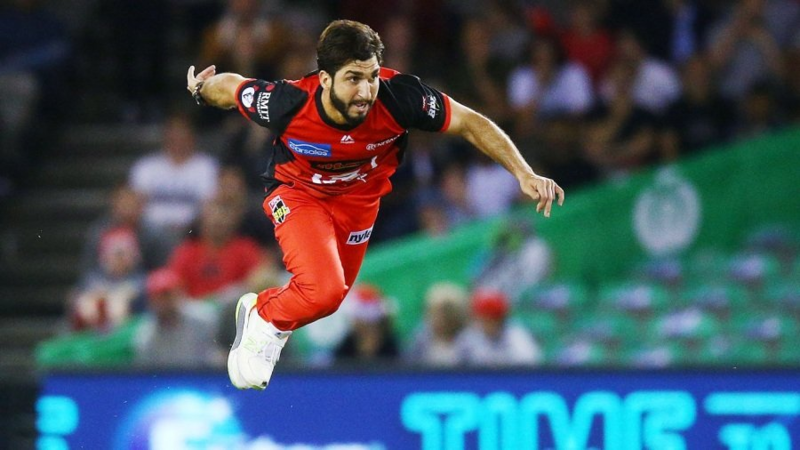 In his debut BBL season where he played for Melbourne Renegades and picked up 8 wickets in 7 games, Shinwari showed why his selection for the Melbourne side was met with approval when it was announced and in an exclusive interview with PakPassion.net, spoke about his experience of playing in one of the most well-established Twenty20 leagues in the world. With the likes of well-established competitions like the IPL, CPL, BBL, BPL and PSL it would appear that there is an oversupply of Twenty20 Leagues around the world. However, from Shinwari’s point of view, there is no such thing as too much cricket, as playing in different leagues offers a unique experience and also allows for his professional development which is also beneficial for his international career. Pakistan Test captain Sarfaraz Ahmed recently lamented the lack of speed amongst Pakistan fast-bowlers but if he had been paying attention to the BBL and especially to Shinwari’s spell against Melbourne Stars, he would have been pleasantly surprised to see one of his bowlers bowl extremely fast. Shinwari’s express delivery which was clocked at 151 KpH was a pleasant surprise for many but was a feat that one should have expected given his role model. The well-funded and sophisticated sports facilities in Australia would have been an eye-opener for someone like Shinwari who has been plying his trade in Pakistan for most parts of his career and those looking to improve the state of Pakistan’s domestic cricket would be well advised to pay heed to his views on the subject. Many Pakistan players of the past have emphasised the utility of playing in County cricket in terms of the professional development of younger players. For Shinwari, participation in County cricket is an important aspect of his progress and can also benefit Pakistan as well. Pakistan’s recent dismal record in Tests has been a cause for concern for many ardent supporters of the side. The seemingly low supply of good talent to the national side is being touted as a major factor in the steady decline in Pakistan’s fortunes as a Test playing nation but if Shinwari’s steady rise is any indicator, Pakistan could well have an excellent Test player in their ranks in the near future. The eyes of the world of cricket are slowly but surely focusing towards the next major ICC tournament which will be the World Cup in England. To be played this summer, the 10-team tournament will feature some of the most exciting and strong teams of world cricket. As 2017 Champions Trophy winners, Pakistan have a reason to feel optimistic with Shinwari confident that his side has the capability to lift the Cup in July of this year. The advent of the Pakistan Super League in 2016 gave a new lease of life to Pakistan cricket which seemed to be lagging behind in terms of providing entertainment to its millions of stakeholders. Now approaching its 4th season, the PSL is considered as one of the most exciting tournaments in the cricket calendar and understandably, Usman Khan Shinwari is excited about taking part in the upcoming tournament and has set some very high goals for himself. “I am really excited about the upcoming PSL season. It’s a unique opportunity to play in Pakistan’s top Twenty20 tournament and I really cannot wait to be playing for Karachi Kings for the third time. Not only do I wish to participate in PSL 4, but this time around, I would like to take as many wickets as possible and am aiming to win the award for the best bowler of the season as well,” he concluded.